5-HTP, or 5-hydroxytryptophan, is a precursor to the neurotransmitter serotonin - which is essential for controlling mood, sleep and pain levels. The body produces 5-HTP from tryptophan, an amino acid found in small amounts in high-protein foods such as chicken, fish, beef and dairy products. It can also be taken in supplemental form, in which case it’s extracted from the seeds of the Griffonia simplicifolia plant. 5-HTP is believed to help increase serotonin production in the brain, which may positively influence mood. 5-HTP may also help with other health issues related to serotonin deficiency, including nervousness, body tension and stiffness and head cavity discomfort. Certain elements of sleep are also believed to be affected by 5-HTP. Supplementing may not only assist with falling asleep faster, but also with increasing the duration of dream states (REM sleep) and of deep slumber. 5-HTP may also promote weight management by helping to reduce cravings for sweets and starches, which may help contribute to healthier overall eating habits. 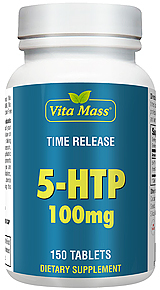 For best results and quickest absorption, take 5-HTP on an empty stomach. Do not take 5-HTP for more than three consecutive months without consulting a healthcare practitioner. Is available at a better value than other 5-HTP products on the market. 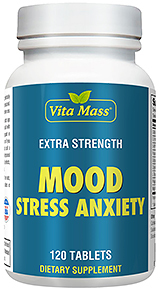 Ideal for supporting mood, sleep, and weight management. Wonderful product. It really helps with my mood! I have used this many times and it helps me get to sleep but not stay asleep. I received it in a timely manner and am happy with the product. Great product, my appetite has been more regulated. Will be buying again. This helps with my difficulty in getting to sleep. Other Ingredients: Vegetable Cellulose, Dibasic Calcium Phosphate, Hypromellose, Vegetable Stearic Acid, Vegetable Magnesium Stearate, Silica, Methylcellulose. No Artificial Color, Flavor or Sweetener, No Preservatives, No Sugar, No Starch, No Milk, No Lactose, No Soy, No Gluten, No Wheat, No Yeast, No Fish, Sodium Free. Suggested Use: For adults, take one (1) Tablets twice daily as needed or before bedtime. As a reminder, discuss the supplements and medications you take with your health care providers. © Copyright 2001- 2019 Vitaminnatural. All Rights Reserved.